There is nothing nicer than receiving feedback from delighted clients, here are just a few. We were delighted with your service. I'm sorry for taking a while to get back to you - busy week! Thank you for the lovely photos. The car looked beautiful and you were very smart. The delays in traffic were frustrating but nothing to do with you. I was really impressed how you gently but firmly parted the crowds on Kings Parade, despite the total lack of attention of most people! The weather held off nicely, the garden party was good, but dinner and the party afterwards, well that was something else, we have still not come down from the high. I wouldn't hesitate to recommend you. One of the things we realised over the course of wedding planning is that what matters most is picking the right people. I loved our chat as your love of the cars and hands on approach was apparent and I was immediately happy you were the right choice for us. I hope you are having a great summer and getting some opportunities yourself to get out with the top down! I just wanted to say a massive thank you for the fabulous service you provided us on our special day and leading up to our wedding day. Hello Nick Kate & Ben’s Wedding, Saturday 19th April at Madingley Hall Thank you for a memorable start to our wedding celebration. When we first visited you to see the car, Kate was very taken with the Austin Windsor, it's style & colour, it proved to be the right choice for the day. The drive from our home to Madingley was wonderful. What initially sounded like a long drive proved not so, the sedate pace & comfortable ride allowed us to relax, have the occasional light conversation & collect our thoughts for the day ahead. Your timing to arrive at Madingley was just right & exactly what Kate wanted which ensured a good start to the rest of the day.Again, Thank You. Thank you Nick for making Hannah and Phil's wedding day a little more special the surprise of having one of your wonderful cars added to the long list of special memories from yesterday. They were absolutely thrilled with it. 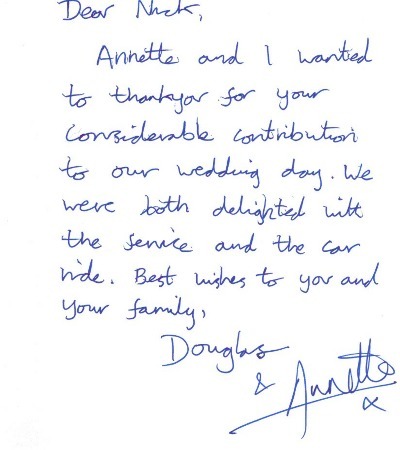 Boxter and myself would just like to say thank you for a fantastic service with the car on the day of our wedding – the children also particularly enjoyed the journey! Thank you so much for driving for us on our wedding day, we loved the car and really did have a wonderful day. Everything worked perfectly for us and thank you for assisting in any way possible, you assisted in helping our day run as smoothly as possible and kept us to our timetable perfectly! Many thanks from all my family for your tremendous help with Sarah's wedding last Saturday. 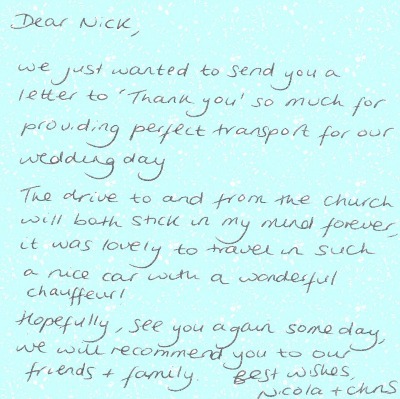 Your thoughtfulness with the longer calm drive to the reception venue was very much appreciated by the newlyweds. I just wanted to write and thank you for your part in our daughter’s wedding. Everything went very smoothly and the day was wonderful in every aspect. 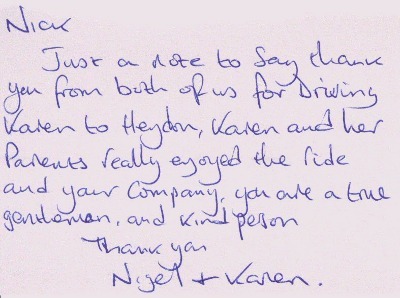 Thank you for your expert driving and your lovely car – we had lots of comments from guests about it. It was great to ride in it. We all had a fabulous day, thank you you very much and the part you and your beautiful car played helped to make it so. Thanks again for such a professional and reasonably priced service. Hi Nick,I would like to thank you so very much all your help to make Kate's day very special she loved it as i thought she would ,we were so lucky with the weather it could not have been better and the rest of the day went well.We would highly recommend you to anyone and will do so and pass on your details . success and Rachel never stopped smiling. 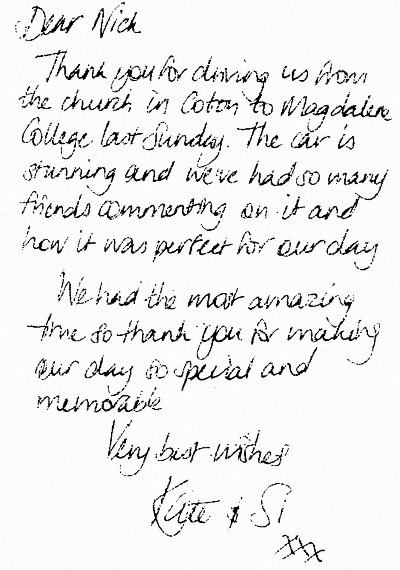 We were delighted with the service you gave us. the part, we have some fab photos. So once again many thanks. I just wanted to drop you a quick line to thank you very much for 9th July. Day. It was a pleasure to meet you and use one of your beautiful cars. looking for vintage car hire. Thank you so much for all your help on the day, you made things run very smoothly!! The car was everything we wanted and more. So many people have commented how wonderful it was! We have some great photos of the car so I will pop some in the post to you. 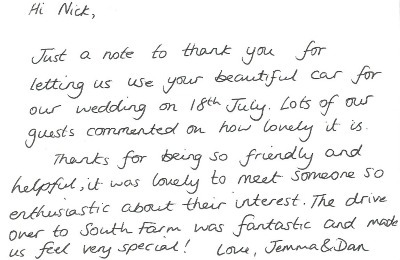 Hope you are well and we will definitely recommend you to anyone else we know getting married locally as you made our big day even more special! Just wanted to say a big thank you for your excellent service on our wedding day. As you know we fell in love with the Harley the moment we saw her and we are so pleased with the choice. I would not hesitate in recommending you to anyone thanks again the Fergusons. You were punctual, and were great, we had the perfect day. Thank you, we will recommend you all our friends. Thanks a million for your service on 10th July. It was courteous, discreet and professional - we enjoyed a lot! photos and will forward you some good ones when they come through! the father of the bride loved his experience! Thank you for providing such a fantastic service. From when we first spoke to the day of the Wedding. The car was beautiful and in fantastic condition. Nick was great on the day, looking very much the part. The overall service was brilliant and we highly recommend them to anyone. Many Thanks for helping the day go perfectly. Thank you! It was a wonderful start to Lucy's day and she was completely entranced by the car and the gentle journey. The rest of the day was as perfect as it could be!